of Phillips Arm on British Columbia’s Southern Central Coast. The Phillips Estuary/ᕈNacinuxᵂ Conservancy protects a significant and unique combination of marine, estuary, lake and river environments. Visitors to the region currently take part in recreational activities such as salmon and trout fishing and wildlife viewing, among others. The conservancy was identified for consideration as a protected area during the Central Coast Land and Resource Management Plan planning process. Following Government-to-Government discussions between the Province and First Nations, the central coast land use decisions (February 7, 2006) confirmed that the Phillips Estuary would become a conservancy. The Phillips Estuary was legally designated as Phillips Estuary/ᕈNacinuxᵂ Conservancy in Spring 2007. See News Release for more information. No facilities or campgrounds in Phillips Estuary/ᕈNacinuxᵂ Conservancy. The Phillips Estuary/ᕈNacinuxᵂ Conservancy is comprised of 1,382 ha of upland and 79 ha of foreshore (1,461 ha in total). The conservancy, located at the head of Phillips Arm, is 53 km north of Campbell River, 122 km east of Port Hardy and 216 km northwest of Vancouver. History: The conservancy is within the traditional territories of the Kwiakah, Xwemalhkwu and We Wai Kum First Nations. Phillips Estuary/ᕈNacinuxᵂ Conservancy is managed collaboratively by BC Parks and the Kwiakah First Nation. Cultural Heritage: The cultural values of the Phillips Estuary/ᕈNacinuxᵂ Conservancy have extremely high significance to the Kwiakah First Nation, who have two historical village sites, Hwihawi village and Matsayno, Indian Reserve #5, located in and adjacent to the conservancy, respectively. Historically, the Phillips River Estuary and the surrounding area provided cedar trees, fishing and hunting grounds and various plants, berries and medicines that were collected, prepared and stored for the winter months. The marine area was a source of eel grass, seals, ducks, crabs and at times, herring. These values continue to be important to First Nations today. 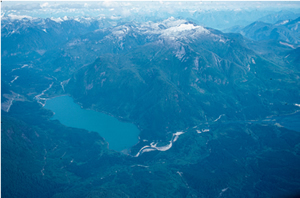 Conservation: The estuary and lake complex are important to both salmon and grizzly bears. The quality and diversity of the marine, estuarine, lake and river environments merge to produce a protected area with high biodiversity and conservation values. Wildlife: Salmon are at the centre of the natural values found in this conservancy. The river, lake and estuary provide high quality aquatic environments that support spawning salmon as well as resident species of fish. The nutrients provided by spawning salmon and the protected riparian habitats help ensure good water quality and provide habitat for a variety of wildlife, including grizzly bears. All five species of salmon are present in this Conservancy. Anyone fishing or angling in British Columbia must have an appropriate license. For your own safety and the preservation of the park, obey posted signs and keep to designated trails. Shortcutting trails destroys plant life and soil structure. Trail Information There are no developed trails at this park. The park is open to hunting. Please check the BC Hunting & Trapping Regulations Synopsis for more information.